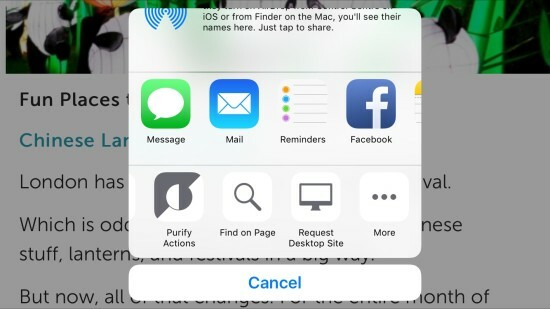 In order to whitelist a website in Purify, the ad blocker for iOS Safari, you need to first access a webpage on the website you want to whitelist, then press the middle “share” button at the bottom of the app window. 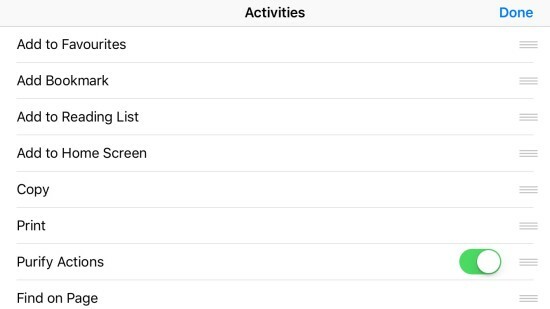 From there, scroll right on the bottom panel and ensure that the “Purify Actions” button is present. If it isn’t then tap the “More” button. A new window will now appear and you will need to check that the toggle beside “Purify Actions” is set to it’s “On/Green” state. Press “Done” at the top right of the screen to return back to the previous menu. You can now select “Purify Actions” from the bottom panel of the menu. Once you are in the “Purify Actions” menu, simply select the website you want to whitelist by selecting it from the whitelist list and enabling the toggle to it’s “On/Green” state, like previously in this tutorial. Refresh the page and your selected website should now be accessible!